KC: ...and bring him to sit down now, please. BK: [in Russian] These are Mercury, Venus, Earth and Mars. Elena Smotraeva - Translator (ES): That’s Mercury, Venus, Earth, Mars. There is some point, some spot on the Jupiter of different color. He doesn’t remember the color. He remembered there was a spot. KC: A spot on Jupiter? KC: And... you saw these planets how? How did you see them? Ask him. ES: [in Russian] How did you see those planets? They’re asking you. BK: [in Russian] I saw them in space. ES: Kind of a space. BK: [in Russian] I can’t draw well, that’s why I can’t draw them exactly. KC: Is that the sun in the middle? ES: [in Russian] Is that the sun in the middle? KC: Okay. And you see these planets from a spaceship or from the planet or... How did you see them? BK: [in Russian] …You can’t see them from Mars. ES: You cannot see them from Mars, really. KC: I see. And did you see them before you were born? ES: [in Russian] And you saw them before you were born? BK: [in Russian] on Earth? ES: You mean the being born on the Earth? BK: [in Russian] When I was flying in space and when I was living on Mars... then I saw them. ES: When I was flying in the space, when I was living in Mars, then I saw them. KC: I see. And was this recently? You remember recent... Ask him was this recent. ES: Mm-hm. [in Russian] was this not so long ago, or was it very long time ago? ES: It was quite long time ago. KC: How long? Does he know? ES: [in Russian] Could you tell approxmately, how long ago this was? BK: [shakes his head] Mm-mm. KC: I see. How old are you now, Boriska? ES: [in Russian] How old are you? KC: When is your birthday? ES: [in Russian] When where you born, what’s your birthday? ES: Eleventh of January, ’96. KC: Ah. Born on the 11th. ES: [in Russian] you were born on the 11th, yeah? KC: And your building is Number 11? ES: [in Russian] the building were you live, is also number 11? KC: ...that you live in now? Dr. Vladislav Lugovenko (VL): [in Russian] Now he is living in building No. 11. BK: [in Russian] And in another city not far from my birthplace Volzhskiy where I lived the building was No. 21 as far as I remember. ES: Mm-hm. He has two places, actually. Before, he was living another place. It was 21st, the number. ES: But now, he moved to 11th. KC: I see. Is Mars in this picture? ES: [in Russian] Is Mars in this picture? Mm-hm. Bill Ryan (BR): The red planet. KC: Is Mars really red? ES: [in Russian] Is Mars really red? ES: Atmosphere is kind of orange. ES: [in Russian] And what is the color of soil on Mars, is it red? ES: [in Russian] _but what is it like then? KC: What is it like? ES: Kind of green, rather. KC: Uh-huh. Are there trees on Mars? ES: [in Russian] Are there trees? KC: Are there trees on Mars? KC: No trees. How did you come to be here in this different city? The name of the city is... What is the name of the city? ES: Which one? The where he lives now? ES: Mm-hm. [in Russian] What city do you live now? BK: [in Russian] In Volgogradskaya oblast. ES: It’s in the Volvograd area. BK: [in Russian] City of Zhernovsk. KC: Okay. And do you understand why you’re living there? ES: [in Russian] do you understand why you’re living there? KC: No? Not really? It’s okay. ES: [in Russian] If you don’t understand, it’s also Okay. BK: [in Russian] Simply, I like more Moscow. ES: I like more Moscow, actually. KC: Oh. I like Moscow, too. Have you been to the Kremlin? ES: [in Russian] And have you been to the Kremlin? BK: [in Russian] In or around? ES: You mean in the Kremlin or around? KC: Both. Have you been in the Kremlin as well? ES: [in Russian] May be, you’ve been in the Kremlin? ES: I was not in. KC: Okay. But you are a telepath? ES: [in Russian] Could you feel as a telepath? KC: You don’t think so? Nyet? BK: No. [in Russian] Not yet. ES: I think not yet. KC: But the professor says you are a telepath. ES: [in Russian] But the professor says you are a telepath. KC: What do you think of that? Show us the professor. VL: [in Russian] Do you remember when I was on the train – and you felt something was wrong? Tell about it. ES: ...moment when they were on the train, and he felt something was wrong. ES: He remembers not so well. ES: There were two... criminals. ES: He like, felt like it, and then he explained. VL: So tell about this. KC: So, Boriska. You can tell us your story. Remember, you did an article for ‘Pravda.’ Do you remember this? KC: Two years ago, you were a smaller child. ES: [in Russian] It was about two years ago, and you were writing for the “Pravda” newspaper, remember? BK: [in Russian] For “Komsomolsky Pravda”? ES: [in Russian] That story, could you tell it once more on camera? BK: Nyet. [in Russian] My grandmother keeps the copy of it. Unfortunately, she lives in Zhernovsk. ES: But it’s not here. KC: Yes. We also have it on the internet. This is how we heard about you. ES: [in Russian] In fact, we have already found this newspaper on the internet, and that is how we learnt about you. BK: Mmm. [in Russian] Yes, it is on internet. KC: You are a little bit famous. A little bit famous in America. ES: [in Russian] and you became famous in America. BK: [in Russian] Well, I was telling when I was six, seven. Now I’m already eleven. ES: I studied with child stories at 6, 7, he says. It was quite some time ago. Mm-hm. KC: Yes. And, are you remembering your stories as well, now? ES: [in Russian] And now, do you remember these stories as good as before, or you already forgotten them a bit? BK: [in Russian] Of course, I forgot already. ES: No. I already forgot some parts of them. KC: Okay. But when you remember, do you remember being on Mars? KC: Yes? And why did you start talking about Mars? Do you know? ES: [in Russian] _Do you know at all, why would you start talking about Mars? BK: [in Russian] I simply recalled. ES: I just recalled about that. KC: I see. And did you recall about other planets, or just Mars? BK: [in Russian] Well, yes. ES: [in Russian] ”Yes” meaning, you recalled only about Mars, or also of other planets? BK: [in Russian] About other planets and about Mars. ES: About other planets, as well. KC: What other planets? Do you remember their names? ES: [in Russian] Could you recall the other planets, which ones they were? Their names? BK: [in Russian] I don’t remember the names. ES: I can’t say about the names. BK: [in Russian] People from Mars traveled in many galaxies and planetary systems. ES: The people from Mars... traveled along many galaxies and planet systems. KC: Did you have friends that you remember? ES: [in Russian] Did you have friends on these planets, or on Mars? Could you remember someone? BK: [in Russian] Most of the friends were from Mars, but some from other planets as well. ES: I had some friends on Mars, for sure. And on some other planets, as well. KC: And do you think they have come here in human bodies? ES: [in Russian] Do you think they have come here in human bodies, just like you? KC: It could be. Have you met anyone else that you remember from your past? ES: [in Russian] Those you met in your past lives, have you ever met them in this life? BK: [in Russian] Yes, in past life, but not in this life. ES: Not in this lifetime. KC: Ah. Okay. Do you think that you are different than other children in some ways? ES: [in Russian] Do you think that you are different than other children in some ways? BK: [in Russian] Mmhm, yes. KC: You think so? But you like to play video games like all children, yes? ES: [in Russian] But you like to play video games like all children, right? ES: Not all video games. BK: [in Russian] I also like to read books. ES: I like to read books. KC: You like to read books? What books have... Can you tell me what books you like to read? What kind of books? ES: [in Russian] What kind of books you read, could you tell us? BK: [in Russian] some scientific books. ES: And sometimes scientific books. KC: I understand that you are good in astrophysics in school. ES: [in Russian] Do you study astrophysics in school? Or Astronomy? ES: No. They don’t learn it at school. KC: Oh. You don’t learn astrophysics in school. KC: Your mother said... Where is your mother? We want her to come in anyway. She should come because she is good. You have a very, very lovely mother. ES: [in Russian] Your mother is very kind. KC: [laughs] Very smart as well. ES: [in Russian] And very smart as well. KC: Does your mother telepath with you? ES: [in Russian] Could you communicate with your mother telepathically? BK: Nyet. [in Russian] But my Mom is able of recognizing of information. ES: My mommy can read information from me. KC: Oh, she can! She’s very smart. Could she come and join us and sit down. That would be wonderful. KC: And this is Nadya, his mother. And she is able to also be a telepath to some degree. This is true? ES: [in Russian] [unclear] This is Nadya, Boris mother. She’s also able of being a telepath to some degree. KC: Okay. And Boriska says that he doesn’t learn astrophysics in school. Where does he learn this? ES: [in Russian] Boris said that he did not study Astrophysics (or as we say it, Astronomy) in school. Where did he learn all these details, then? NK: [in Russian] From early childhood, we had a lot of books on Astronomy. When he was three to four years old, he opened these books and started to tell numbers of the galaxies although they were in Latin. It was amazing. Now, he doesn’t go to school every day. He goes to a kind of family or external studies school. Almost everything we study at home. In one month, we will study one subject, then take an exam. It is called accelerated development. ES: So, first of all, we had lots of books. NK: [in Russian] It is called accelerated development. ES: Books for astronomy, astrophysics, astrology. But they were not really in Russian. They were in Latin. ES: Yeah, and three, four years old, when he was very young, he has studied off of his books. ES: And was big interest and showed some galaxies that some names, some numbers, and it was so fascinating. And later on, they entered the school, but it’s a very special school. They don’t go regularly to school. It’s kind of family-type. ES: They stay more or less at home. But they read and teach him themselves. ES: And sometimes he visits his family school. KC: I see. 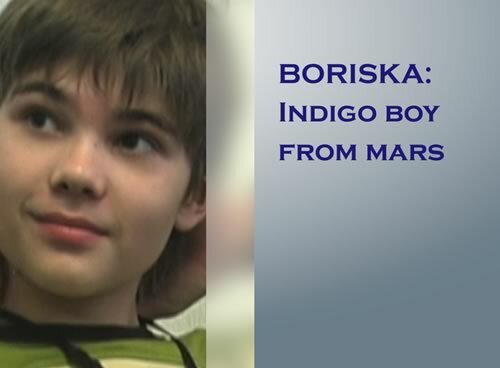 And... now when Boriska first started talking about Mars, how old was he? ES: [in Russian] When did he start talking about Mars, how old was he? NK: [in Russian] I think he was around four or five years old when he was showing some elements of what he is talking about. NK: [in Russian] But at the age of six to seven years, he started giving out much clearer information. ES: And six, seven was much more. KC: I see. And does his, does he have a father who is with him also? ES: [in Russian] Are you living together with his father? NK: Nyet. [in Russian] Now we live just two of us. ES: No. We live just two of us. KC: I see. And so, he didn’t learn this from his father or from his grandfather? ES: [in Russian] Could he learn it from his father or grandfather? NK: [in Russian] We did not have grandfather. ES: There is no ... Father as well. NK: [in Russian] When Borya was born, both grandfathers already passed away. ES: Actually, when he was born, there were no grandfathers from both sides. NK: [in Russian] His father didn’t ever show interest in Astrophysics. He was an army officer. ES: His daddy’s an army officer. KC: I see. And does his father know that Boriska is a special boy? ES: [in Russian] And does his father know that Boriska is a special boy? NK: [in Russian] Yes, the information reaches him, I think. ES: He got the information somehow, I think. KC: Ah. Okay. But not from you. KC: I see. Okay. Okay, Boriska. So, you can tell us what else do you know about Mars. Is Mars... Do you know about Mars right now? Are you able to see what is going on there? ES: [in Russian] Could you tell what is known to you about Mars, maybe you’re able to tell what is happening on Mars right now? BK: [in Russian] Nothing is happening on Mars now. ES: No. Nothing happens on Mars. KC: Oh, really. And what happened in the fut[ture], in the past? Was... What happened to you in the past in Mars? NK: [in Russian] Tell them everything you know about Mars. Everybody here is a friend. Everything’s fine. KC: Yes, it’s not... We are not a big deal. We are not a big television show. KC: We are... just like you. We are just regular people and we are just coming from California to see you and talk with you. It’s okay. Anything you want to say. Okay? ES: [in Russian] They want to tell you that they are not some television show or something of this kind, they are just regular people. It is just that they live in some other part of the Earth, in California, or England, and they came to meet with you, because they really want to learn about you. ES: [in Russian] So please tell them. KC: It’s no big deal. ES: [in Russian] And don’t you be concerned. ES: [in Russian] Don’t you worry. NK: [in Russian] All this be edited. BK: [in Russian] I understand. NK: [in Russian] The film will be made of fragments. BK: [in Russian] It won’t go anywhere on TV. KC: Ah. This is not on television yet. No, not yet on television. ES: [in Russian] _Don’t worry, it is not on television yet. ES: [in Russian] It will be posted on internet. KC: [laughs] So, on internet. NK: [in Russian] Just tell what you know about Mars. Everything. Tell them about your incarnation millions of years ago. ES: Just tell what you know about Mars. NK: [in Russian] At this point, tell them about your incarnation millions of years ago. ES: How it was some millions years ago. BK: [in Russian] How should I start then? ES: How should I start then? KC: Start with when you were living on Mars. What did you do there? ES: [in Russian] When you lived on Mars, what did you do there, for example? BK: [in Russian] What else could Martians do? Just warring. ES: What Mars people could do, just make wars. KC: Make wars? Ah. Were you a soldier? ES: [in Russian] So you were the same, were you a soldier? BK: [in Russian] More of a pilot. ES: I was kind of pilot. KC: Pilot? Okay. Did you fly air... a ship? ES: [in Russian] Did you have your own ship? BK: [in Russian] Not necessarily. ES: [laughs] Not really. [in Russian] Then, how? KC: How were you a pilot? ES: [in Russian] What were you piloting? BK: [in Russian] A spaceship. ES: I was a pilot of a spaceship. KC: I see. And can you draw the spaceship that you were a pilot of? Are you able to do that? ES: [in Russian] Could you draw that ship, how did it look like? KC: Flying saucer or no? Or, round saucer? UFO? ES: [in Russian] At least approximately, could you tell us about its shape? Was it elongated, or like a saucer? BK: Nyet. [in Russian] Not like a saucer…Martians did not use such a shape. ES: Not like a saucer, for sure. ES: Because Mars people do not use such forms. KC: I see. Okay. What do you they use? ES: [in Russian] Then what kind? KC: Did you use energy? ES: [in Russian] Did you use any special sort of energy? BK: [in Russian] Plasma batteries, Ion batteries. BK: [in Russian] Those were batteries. But if something like a gasoline tank was used, the fuel ran out too fast. The engines were too powerful. ES: The gas, normal gas…. Normal gas, like you use from stations, couldn’t be used really much because the engines were very, very powerful and the gas would run very quick. So it wasn’t very big deal to use it. KC: I see. And what about... Did you use force? Circular force? ES: [in Russian] Did you use rotating force, round rotating force? ES: [in Russian] Or magnetic force? BK: [in Russian] Not magnetic. Not magnetic. But rotating though…The engines…Not the engines themselves but the turbines…Turbines were rotating and plasma took fire somehow. I didn’t study these characteristics in detail… And then they would speed up. Unfortunately, such an engine didn’t let a ship fly out of the solar system to neighboring solar system or even to another galaxy. KC: Uh-huh. I see. Did you do time travel? You know time travel? ES: [in Russian] Did you do time travel? BK: [in Russian] Meaning, portals, Mom mentioned? ES: Time portals, you mean? BK: [in Russian] Portal is the same like teleport. It slows down time and opens a kind of portal where time is speeding up fast... I can’t say exactly. I don’t remember. It opens on one side and in a few seconds or even minutes if the transfer is far away it opens in another area of space. KC: I see. And did you go forward and backward in time? Or did you go to other places? ES: [in Russian] Did you travel forward and backward in time, or did you travel in different spaces (dimensions)? BK: [in Russian] Nyet. It has almost nothing to do with time. The portal just opened. And not all ships had the same principle, by the way. Ships with plasma engines were limited to travel only in the solar system on high speed. However, the ships in a shape of a drop were carrying other ships. There was a hatch on them. Inside upper part there was a freight module. And since these drops were huge, they could take one ship, an airplane or a triangle inside of the lower bottom part. KC: Do you know the names of the places that you might have gone? Galaxies, anything like that? BR: Let me take that. BK: [in Russian] Names of galaxies I don’t remember. And on which ships exactly? We didn’t travel much on ships with plasma engines. It would have taken too many days to fly to another solar system. ES: So these plasma engines were quite slow, so we didn’t use them much, because you need to have so much time to use them, to come to a planet system. KC: What was the war about, anyway? ES: [in Russian] _You told us that Martians were involved in wars a lot, right? ES: Who were they warring with and why? BK: [in Russian] With (among) themselves. Meaning, not exactly with themselves… There were different races on Mars. And each of these races was in war. Each race had its own technology and innovations. For example, if we had plasma and ion engines, others had energy engines. ES: There were different races on Mars. And they had wars against each other. KC: Can he describe what the races looked like? ES: [in Russian] Would you tell, what those races were? BK: [sighs] [in Russian] Each race had its own technology and innovations. For example, if we had plasma and ion engines, others had energy engines. But it would not mean yet..that if on Mars were different races, each race when they became militant and started wars against each other. Each race was became absolutely individual and had different equipment, different weapons and even different ships. Though not all the ships were different. ES: From some time, they started to make wars, and so became more individual, like stopped communicating much and exchanging technologies with each other. KC: I see, but what did the people look like? Did they look like us? ES: [in Russian] How did people and beings that lived there looked like, like us or somehow different? BK: [in Russian] Well…Not exactly like people. ES: Not really like we, like people. KC: Not really like people. BK: [in Russian] But they did look somewhat alike. ES: Quite like, but not fully the same. KC: How were they different? ES: [in Russian] How were they different? BK: [in Russian] They were bigger, taller, stronger. ES: They were higher, stronger, more able. KC: I see. Boriska, did you look different? ES: [in Russian] And you too looked different, not like you are now? BK: [in Russian] Of course. KC: How did you look? Can you draw yourself? Do you know? ES: [in Russian] Would you be able to draw yourself, or describe somehow? BK: [in Russian] Nyet. I don’t remember. ES: Can’t really remember myself. KC: I see. What do you think about people now, here, on this planet? ES: [in Russian] What do you think of people now, when you look at them? KC: Are they fast? Are they slow? Are they smart? KC: Tell the truth. Tell him to tell the truth. BK: [in Russian] I don’t like to speak bad of people. ES: I don’t like to speak bad about people. KC: Do you have good things to say? BK: [smiles] [in Russian] Good…of course! KC: Okay. What are they? ES: [in Russian] Tell, what is good. BK: [in Russian] It depends on which people. If people always help or invest money in important things. For example, if there is a war and people invest money in new equipment which can stop the war or help... Or if they make funds to help ill children or children who can’t walk. ES: [in Russian] Like that? [in English] So, people are different. And some people do something really good, like they want to stop wars and they create some technologies, and they invest money into the technologies which would stop wars or would help people. That’s good. ES: It’s also good to organize foundations which will help people, children. Children with problems. BK: [frowns and waves his hand as if to say enough] [in Russian] That’s Okay, Mom. KC: Huh? [laughs] On the train. Ask him, on the train, were those good people that were bothering his grandfather? Or his, the professor, I’m sorry. ES: [in Russian] Remember that story with your grandfather or professor when someone offended him on a train and you had a feeling about it. How did you get a feeling that they were bad people. BK: [in Russian] Frankly speaking, I didn’t feel anything. NK: [in Russian] Simply tell, how you get a feeling about that, what did you feel. BK: [in Russian] Mom, shall I tell you… how I knew…I don’t feel. Vladislav spoke about it very loud, that it could be heard in the whole apartment. KC: Tell him, tell him that what we are doing here is to help the world. ES: Just wait. They are having a mother... mother-child talk. My mother says, ‘Do that.’ And he just... no, then no. KC: ...and to increase communication about other dimensions. ES: [in Russian] This video they’re making will be posted on internet. There’s a website, which purpose is to encourage people to be fair with each other, to stop wars and be understanding towards each other; so that people would have better understanding of other races and civilizations, and in general, the purpose of this video is, among others, to stop wars. BK: [in Russian] from Mars and from other galaxies as well. NK: [in Russian] You told about the Saturn project and Jupiter project...but please! BK: [In Russian] Thanks to you… Mom! These projects, they were not so clear-cut. ES: There were some stories he already told me, his mother says, that, for example, with all these bloody wars, where there were so many people who died on planet Earth, on the planet of Mars. So please tell them that the wars are bad and she reminds him about the project Saturn he was speaking about, and then he says, ‘Well mom, this project was not good at all. There was some bad sides.’ And this I think they discuss that. NK: [in Russian] Don’t keep silence, please. NK: [in Russian] You don’t talk at all. You should tell everything about what was going on for millions of years on Mars. ES: Please tell all these tales of years what you know, that there was this project on Mars which was prepared, actually, to do something recently. KC: What is the project on Mars that they are talking about? ES: [in Russian] What is that project on Mars? It is really interesting. BK: They wanted to make Jupiter into second Sun. KC: What they were going to do to Jupiter? ES: [in Russian] How was it possible to transform it, to fit it in? BK: [in Russian] There was some sort of energy contained in these capsules. ES: The capsules contained some energy. KC: Mm-hm. Were going to cause explosions on Jupiter? ES: [in Russian] So that it would all explode, or for what? ES: Jupiter could kind of take energy from it. ES: Draw it in, and then start to be a source of energy. BK: [in Russian] As I’m saying, it wasn’t exploding, it was being absorbed by it. ES: So the energy was kind of like, sucked... in. KC: Sucked in. Okay. What happened to the energy, because Jupiter is not a second sun? ES: [in Russian] But as of now, Jupiter is not a second Sun. Why this project did not succeed? BK: [in Russian] Not because of a lack of capsules. There were plenty of them. You could bring them every day. But there was a war on Mars. ES: There was a war on Mars, and that they didn’t come to the full realization because of that. They were not organized enough because of these wars. Because of the wars it stopped. KC: How did they kill people in this war? ES: [in Russian] In these wars, how were they killing, with what? BK: [in Russian] With weapons. I can’t tell more. VL: [in Russian] And he affirms using Vedic sources and other historic documents that galactic wars have been fought for many thousands of years on Mars. VL: [in Russian] And in told times our civilization was more developed in the cosmic sense. He established that there were spaceships like a womb which carry smaller ships inside. KC: We’re going to talk to you while you play your game, okay? Do you mind? ES: [in Russian] You will play your game, and we’ll be asking you questions. Okay? KC: And we want to know, why you came to this planet. ES: [in Russian] We would like to know, why you happened to be on this planet? BK: [sighs] [in Russian] This was a transmigration of souls. I was killed and everybody was killed on Mars. ES: Everybody was killed on Mars, actually. BK: [in Russian] There were not many souls on Mars, so they would use special stones to attract souls. ES: And so Mars people used special stones to attract souls, because there are not so many souls on Mars. KC: And your soul did the attracting? ES: [in Russian] And how it happened with your soul? BK: [in Russian] They probably broke these stones and... it wasn’t just my soul, there were many souls. Then they died... not died... people died, I mean Martians, and migrated. ES: So, there were lots of souls in the stones, and some stones got broken somehow. And then the souls from the stones altogether came to Earth. KC: The souls from the stones. KC: How do you mean? ES: He explained a little bit early. So there was these stones. In these stones were trapped the souls. Attracted. And some stones got broken, and the souls from the stones came to Earth. KC: Is that how you came to Earth? ES: [in Russian] Is it exactly the way you came to Earth? BK: [in Russian] Yes. The Martians created these stones. There were not enough warriors. ES: So Mars people... had to abandon invent these stones because they lacked peoples for war. KC: Were you killed in the war? ES: [in Russian] And were you killed in the war? KC: How did you die? BK: [in Russian] (playing game) wait, wait… that’s it. Speak, please. ES: It is considered this way that I died in the war, but actually, it was not really special war. It was not just between races on Mars. There was some attack from somebody else. And then he stopped. Mm-hm. KC: Do you know who the attack was from? ES: [in Russian] and with whom was this war? BK: [in Russian] The war started when they made Merkaba – this is a device which teleports a soul to another point. And they teleported to the Earth. But I didn’t see that and I didn’t do that. I just read about it in an information source. ES: So there was some Merkab. It was kind of a device which was used to trap souls and bring them to Earth. And actually I didn’t do that. I didn’t see that. I just read about it in some information script. KC: Was this a book that I can read? ES: [in Russian] May I read that book, too? Where have you learned that from? BK: [in Russian] A book? It was not a book. ES: It was not a book. BK: [in Russian] It was not a book but an information storage, something like the internet. At those times it was like a hall of computers where you enter the internet. Almost the same, almost. ES: [in Russian] Was it then, or now? ES: Uh-huh. It was in that time they on Mars read it. It was kind of like an internet. It was information portal, blog, where you could get some information from. And then he read it in such a place that they used these devices. In that time there. Not now. [in Russian] [unclear] did you got that? KC: Do you read on the internet now? ES: [in Russian] Do you read on the internet something now? KC: Okay. Is there anything more that you can tell us about Mars that you think the world should know about, at this time? ES: [in Russian] Do you know anything else about Mars, something more that we could tell other people about it? BK: [in Russian] But what exactly? ES: [in Russian] Something that is important…in your opinion, what is important to tell other people? BK: I don’t even know what’s important on Mars. I can’t remember how to construct even a simple blaster. KC: And do you know anything about the future of the planet... Earth? ES: [in Russian] Do you know? BK: [in Russian] But, yes! ES: [in Russian] Yes or no? BK: [in Russian] If… well, not IF…Sometimes around 2012, or even 2009, there will be catastrophes. ES: In 2005. In 2012, in 2009, even, there could be a catastrophe. ES: [In Russian] What kind of catastrophe? BK: [in Russian] There will be a flood. ES: Something with water, this kind of flood. KC: is it going to come in Russia, or in other places? ES: Something with water. This kind of flood. KC: Is it going to come in Russia or in other places? ES: [in Russian] Will it be in Russia, or in some other countries? BK: [in Russian] in short, It will be everywhere! ES: It would be all over, actually. BR: Mmh. Does this worry him? Is he scared of this? ES: [in Russian] Does it frighten you, is it scary? Do you worry on this subject? BK: [in Russian] On what subject? ES: No. I don’t worry about it. BR: He’s not worried about it. KC: Are you going to be in the water, or is it going to happen somewhere away from you? ES: [in Russian] Will you be able to escape it, somehow? ES: No. I couldn’t, I cannot escape it, but it doesn’t worry him, somehow. KC: Okay. So, it will come to Moscow? ES: [in Russian] Will it come to Moscow, as well? KC: I see. And is, are the people going to survive? ES: [in Russian] Will people survive this flood?...Hmm? ES: [in Russian] Will people survive this flood? ES: Yeah. Some people will. KC: Are you going to survive? ES: [in Russian] Are you going to survive? KC: Could be. Is your mother going to survive? ES: [in Russian] Is your mother going to survive? BK: [in Russian] Perhaps, I don’t know. ES: I don’t know, really. ES: He doesn’t seem to do. ES: [in Russian] Thank you very much, it was a great pleasure talking with you. ES: [in Russian] They were delighted and they think, you’re a very nice lad. KC: And we will keep in touch with him over the internet. ES: [in Russian] We will keep in touch with you over the internet. KC: ...then we will listen. ES: [in Russian] If, for example, you remember something and would like to tell them, you could write to them, or communicate them somehow. Okay? KC: And, has he met lots of friends? New friends here? Ask him this. ES: Mm-hm. [in Russian] Have you met a lot of friends here? BK: [in Russian] I don’t have friends. Almost. ES: I don’t have really friends. KC: Almost no... But you are so charming. KC: [laughs] Tell him he will have many girlfriends in the future. KC: So you are... bio...physicist? Dr. Valdislav Lugovenko (VL): In present time, I am bio... I am study bio fields. VL: And, particularly, I use it for breathing of the Earth. KC: For... whating, what the Earth? BR: Let me check what I understand, and I will forget. KC: The breathing of the Earth. BR: ...and geomagnetics. But now, it’s, he’s moved on to how applying this to living organisms. Is this? This is correct? BR: ...that breaths. And this can be measured by measuring the geomagnetic fields of the Earth and how it rises and falls in different parts of the Earth. KC: But how does this relate to Boris? VL: ...is very interesting children and because he is indigo. VL: We have very big possibility. VL: We have very big mind. [in Russian] brain? Irina Vorontsova - Translator (IV): Strong brain. KC: Okay. Good brain. And. VL: He may be feeling another. Even, if you... For example, I was in train and have not good situation. VL: And he feel the situation. VL: I explained him and it real, he feeling, feel. BR: He feels the same thing. VL: Yes, yes, yes, yes. KC: I see. Then for the Earth, is this for healing the Earth? Healing? Could you tell him, ask him healing? Is he using Boris to heal the Earth ley lines? KC: You understand ley lines? BR: This is huge, huge chunk. IV: I don’t know what’s ley line. KC: Ley lines. Stone Henge. KC: Ley lines on the planet. BR: Lines, lines of energy. Lines of power. VL: [in Russian] we investigate triangle … for example, England, Stone Henge. VL: For example, England. Stone Henge. VL: Egypt, and so on. VL: In the North our country, In Moscow. VL: And for example Kharkov and Kiev. We have different situation because we would have very big energy. Very good energy. KC: Energy. Good energy in the midst. VL: And Moscow... weaker. Weak. More weak. KC: It’s weaker in Moscow. VL: And Kharkov, very weak, very weak. VL: And we have in this place we have very big magnetic anomaly: Kursk anomaly. VL: But we have special measurements in Kharkov, Belgorod, Moscow, Troitsk and Surgut. VL: Surgut (Сургут) very good. Very big biofield on the children. In Moscow – so- so. VL: And Belgorod, Kharkov, very low. VL: Approximately, twenty or thirty percent. BR: It’s not connected. Oh, it’s not connected. Okay. VL: [in Russian] How to say it, случайно, random? IV: [in Russian] What do you mean by random? IV: He met Boriska by chance here in Troitsk. NK: [in Russian] at the Convention of Indigo children in the year 2005, we met . KC: Can you translate for us? IV: It was my conference about indigo children. NK: [in Russian] On January 31, 2005. IV: In 2005, 31st January. IV: And so they met. IV: There on this conference. KC: Okay. And what did he say to bring you to the city? You translate for her? My question. KC: Could you translate into English for the camera? NK: [in Russian] We are now arranging a place to live in Moscow. IV: Because they didn’t have a place where to live and Vladislav offered his apartment to stay temporary. IV: Before they find another place to live. IV: Of their own apartment. So that’s all. BR: Why did they come here and stay here? IV: [in Russian] Why have you decided to live here, and not to return to Volgograd? VL: [in Russian] the school for children is here. NK: [in Russian] The school for Indigo children is in Moscow, we are studying n Moscow since the year 2005 . NK: [in Russian] it is happened that myself, since childhood, I was able to see the Aura of the people. Therefore, Borya came not by chance, it was all coming, it seems, by the cosmic flow. IV: They still visit indigo children. NK: [in Russian] I could see aura of the people, and I have extrasensory abilities. So that Borya came down by some certain cosmic ray . IV: She can see all of us. KC: Could you explain what she just said in English? NK: [in Russian] I have extrasensory abilities since childhood, you could explain. IV: She said I have all extra sensoric, extra sense. IV: Yes, ability sensory see. KC: Extra sensory abilities. Yes. Very good. IV: Extra sensory. Yes, and she can see auras as well. KC: And she can see auras. KC: Auras. Okay. And so she knows her son has this ability? KC: Okay. And then she brings to Moscow or this area. It’s not so close to Moscow though, right? So she... but to teach her child? BR: To a special school. IV: Yeah. Special teacher, special school. BR: Is he doing well at school now? IV: [in Russian] How’s his school performance at this time? KC: Okay. So, you work with Boriska also. VL: And I every week to work with very many children. KC: Are they all indigo or only Boriska? VL: ...they all indigo. All. All. VL: Present time, all children indigo. VL: If you have ten or eleven or less, yes. KC: Under ten and eleven. I understand. KC: Years of age. They’re all indigo. VL: If you fifteen or ten, it is so so maybe. VL: Indigo or no indigo. KC: And what kind of test do you give Boriska or the indigo children? VL: I have special test. We have twenty-five parameter. Twenty-five parameter. Special bio energy passport. IV: Mm-hm. Bio energy passport. VL: In this passport we have the number of the ‘spiranda’. VL: Spiral of ‘DNK’ – how? VL: We have volume of the mind. [in Russian] how to say? Volume? IV: In percentages. That’s interesting. IV: Connection with higher self? VL: We have different parameter of the aura. Our flow on the chakra. VL: ...physical body and three chakra on our head. KC: Oh. But where did you learn about chakras? KC: This is not normal. This is not normal scientific knowledge. NK: [in Russian] Solar, galactic. VL: ...and planetary chakra. For example, to say about aura, they say: we see our soul. KC: But you do not use them to communicate. The government is using your work, or no? KC: This is what I thought. VL: In fact, I am work myself [in Russian] how to say it? VL: But I have very many article, and one article in England. KC: [opens book] All right. Okay. Thank you. Yes. VL: Okay? Another article it not published. VL: In this time maybe you may possibility to publish this article. VL: The name is, in Russian, «Российские дети Индиго» ‘Russian Indigo Children’. VL: Children Indigo of Russia. KC: I see. Okay. Wonderful. KC: We were talking about how Boriska, how he looks when he was seven, and now he is actually eleven years old. And there was such a difference in.... he... his recall is not as accurate, not as deep. He’s having trouble remembering things. He’s more focused on growing up as an eleven year old in society now. And he’s quite grown up, actually, for eleven, in many ways. BR: Yeah. Well, the feeling I had... If you look at this picture of him here, with all the artist impressions done for the magazine, which is where it was published, I think, you can see the innocence of a seven-year-old when he first started talking about this stuff. And now he’s eleven. A lot of people have asked him all these questions. He’s been surrounded by university professors and journalists, and these people... It was a little bit like somebody who’s told the same story so many times, like... Sometimes people ask me what it was like living in Africa when I was a child. And I remember the first time people were asking me this. I was interested in the question and I’d get really animated when I was recalling, living it, in West Africa when I was a little kid. And now when people ask me, it’s like, ‘Oh, I just lived in Africa.’ And... it’s like if you tell something over and over again, it just becomes boring to tell it one more time. This was the feeling that we got from him. And actually, he’s just trying to be an eleven-year-old, really. And this is the kind of thing that I’ve heard many times before. That you get a little kid who might remember details of their past lives when they’re very young and they’re four and five and start talking about strange things to their parents over dinner. And by the time they’re nine, ten, eleven, twelve, they’ve just forgotten all about it, because they’ve been swamped by all this stuff that’s happening on planet Earth. KC: For me, I saw a little boy who does remember things, but they’re fleeting. They’re not... they’re like the fleeting kind of images from dreams, and those are very hard to put into words to the people around you. So I think that he remembers the images in his mind, but it’s much more difficult now for him to verbalize, and he also seemed to be going through whatever a young child goes through right before puberty, which is a lot more self-consciousness among adults than probably he had when he was seven and started talking to the reporters. I didn’t get the impression he’s been asked about this all that often, but I do think he’s very self-conscious now, because he’s growing up. And he knew there were cameras and the pressure of all the people and the situation seemed to be weighing on him in a way. And he may be going through some emotional traumas. He says he doesn’t really have any friends and so on. But he did seem to have recall of things. He talked nonchalantly about Earth changes starting in 2009. And of water that he saw coming, and he talked about war, and he also made a big distinction between talking about bad things about people that he really didn’t want to say anything bad about the humans around him. BR: That was very strange. He was not. KC: Yeah. And yet he didn’t even remember his telepathic experience with his professor in which he was completely tuned into what his professor had experienced on the train home one night. He said he’s considered to be an unusual child by others. He’s aware of this, and I think it’s coloring his world and maybe in not such a... not making life so easy for him. But he’s precocious. He’s charming. He’s delightful. He’s like a little imp. He has a lovely sense of humor. He’s light. He’s really brilliantly intelligent, and all of this will come across on the film. I have no doubt. And we have developed a relationship with him that hopefully will go on. And we will be able to... He says he’s a writer. He likes to write on the internet. So we will see if there’s proof of this. And we’ll go from here and hopefully this is just the beginning. He’s a fascinating little kid. His professor is doing some advanced work with indigo children in general, that his government is not completely fully behind, apparently. And he has a book that he’d like to get published. There were many wonderful things. His mother is also, has telepathic gifts. She was completely in tune with him telepathically when he was younger. They could touch hands and he could, in essence, show her things. Take her to other planets. Make things available to her. In ways that she, made her completely know that she had this very special child. So, it’s all very fascinating and I think that we... I think it was well worth while and there’s just more to come about this. BR: ... that’s how it belongs. It’s actually what it is. So historically, from what he has been on record as having said. KC: But just think of this will be... This is him at eleven. If we even came back in six months, he may be in a completely different place. KC: ...real money to speak of. BR: And he has no father. KC: He’s a special child on top of it. KC: His father’s not around. BR: And his father is not around to recognize that he is who he is, because his mother said that she thought that he had probably heard about him, which is incredible. BR: Which means that he must have been off the scene before he was seven, which probably means that he can barely remember. BR: And that’s pretty tough. That’s already tough. KC: Yeah. This video we have shot will show an eleven, twelve-year-old indigo child in the throes of a life experience that other indigo children will be able to see and who are going through the same thing and will be identify immediately with him. KC: Visually, by his mannerisms, by his persona, by his intellect and the brightness in his eyes. All of that will come across.